Few consumer experience award tables are complete without an Apple product in the line-up. The company is universally celebrated as leader in consumer experience. But, as outlined below, recent problems relating to the off-boarding of these products highlight Apple’s failure to give consideration to the whole of the consumer lifecycle. In this article I should like to look at Apple’s opportunities for improving consumer off-boarding in its products and services. The consumer lifecycle can be broken into three sections:on-boarding, usage, and off-boarding. As providers and consumers we have a sophisticated, emotional response to on-boarding through marketing, advertising and packaging. After this we should enjoy the design and manufacture of these products, while using them to improve our daily lives. But the end of the consumer experience of the product’s lifecycle is left lingering in limbo by a biased consumer model, that fails to deal with consumption ills, missing an opportunity to reclaim materials, delete data or say a proper goodbye, amongst other things. Good consumer endings (off-boarding) can encourage reflection, inspiring consumers to consider the benefits that they have experienced. And in turn such consumer endings can take responsibility for the aftermath of the possession of the product. They also help companies to design a complete consumer lifecycle that can mitigate consumptions ills. Not to mention vastly improve the opportunity for resale. Let’s consider Apple’s opportunities to deliver consumer endings through the lens of a few recent events - 32bit apps, a new patent submission for detecting broken screens, battery lives and a recent experience I had when I returned a 10 year old Macbook. Although seemingly unconnected, these events could provide Apple with a wonderful palette of tools to off-board their consumers in a more meaningful, emotional and beneficial way. I’d like to start by assessing these events, and shall then consider how they can be assembled to improve the consumer off-boarding experience. With the release of iOS 11 in September of 2017, 32bit apps stopped being supported. Of course, a natural evolution of technology sees old formats die off. Apple revealed its intention to do this to its App developer community as long ago as October 2014, so it should have come as no surprise to many active App developers. However, the press and many users were surprised such a thing might happen. As consumers, maybe we have ambitious expectations of our software lifespans? This could be down to the lack of acknowledgement producers give to endings. They pass on very little information to the users of their software.This probably fuels a mindset, unconsciously, in all of us that consumer endings never happen. But the termination of support served as a crude wake up call for those in denial when once-loved apps failed post iOS update. Beyond the technical advice available from Apple for closing an app, there was virtually no communication from Apple to consumers that an App is in terminal decline. Maybe if there had been, consumers would not be surprised when the end came to a favourite piece of software. With higher expectations of a phone’s physicality - they are now thinner and lighter with a wider screen - durability risk increases. Broken screens, a rarity in the period of Nokia, are now a common sighting. 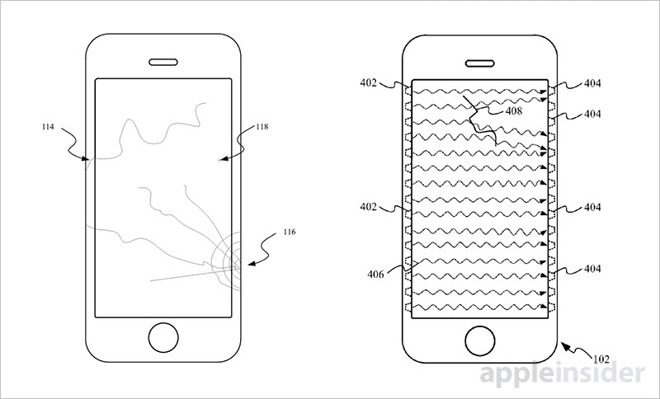 A recent discovery by Appleinsider.com, revealed a patent submission from Apple about software that detects a broken phone screen. The filing, called “Coverglass Fracture Detection”, proposes that a combination of software and hardware can detect a crack, even a hairline crack in the phone’ screen. Such a feature can be part of an information pattern that indicates a products demise. We will come back to this later. Lately Apple has been fumbling with the issue of older batteries by fiddling with device behaviour. It chose to slow down older devices secretly through a software update, seemingly with the intention of pushing those who couldn't tolerate a slower phone to go out and purchase the next device - an example of classic technical obsolescence. After some consumers became increasingly suspicious of their devices’ behaviour, and others started lawsuits, Apple succumbed and admitted it had been juggling the metaphorical battery books. Responding to these accusations Apple claimed that they had customers’ best interests at heart, and they were trying to protect the devices from overloading circuitry. Either way, it has not been good for Apple's brand perception. But what we do know is that they are somewhat aware of how capacity loss is happening in batteries as they age, and they are tracking this. Another piece of feedback that could be useful to consumers were it placed in a more informative and helpful setting. In addition to these examples, I should also like to include a personal experience. I returned a 10 year old MacBook that my youngest child was using, because it had started to swell and cracked the trackpad. We had updated the hard drive a couple of years ago - well he did (https://youtu.be/uDXQIQPMMVc), but the device needed more investment for repair beyond what it was worth. So we decided to get rid of it. We followed the instruction on the Apple website - deleted the files, erased the hard drive and took it back to an Apple store. They were happy to receive it, and gave us a paper form to fill in (hooray, I love filling in paper forms). It came as little surprise how emotionless and barren this was as an experience. The decade- long relationship between my family and Apple was not acknowledged or celebrated. There was no opportunity or space to reflect on the enormous pleasure that this device had provided me or my family. And there was no reward for our decade of loyalty. This was a lost opportunity to enhance a wider relationship with the Apple brand. The dull paper form summed up the entire experience -, legal, emotionless, stunningly dry. Merging the elements into meaning. Despite those examples of poor off-boarding from Apple, Apple seem to have a rich source of knowledge and components which could provide a good off-boarding experience. They just fail to assemble these into anything meaningful. Apple knows the consumer pretty well. Through the device, iTunes and the App store, they know heaps about behaviour, age and the state of the device and future stability of apps. These elements are currently left as what you could describe as experience islands. They are scattered, and can only be interpreted by the consumer as disorganised indifference from the provider. This leaves the consumer feeling helpless, grappling with the assumption they need to buy a new phone/computer/charger to solve the problem and be considered an efficient consumer again. Manufacturers provide a clear path for on-boarding at the beginning of the consumer lifecycle. They pull together complicated information about function, payment, data and identity etc, into one coherent and meaningful experience. In software this often takes the form of a Set-Up assistant. Apple has a well-respected version of this for the iPhone which emotionally frames the situation and smoothly on-boards the consumer to the Apple experience. The diagram below shows this as a starting experience, with the user’s engagement climbing as they progress through the Set-Up assistant. 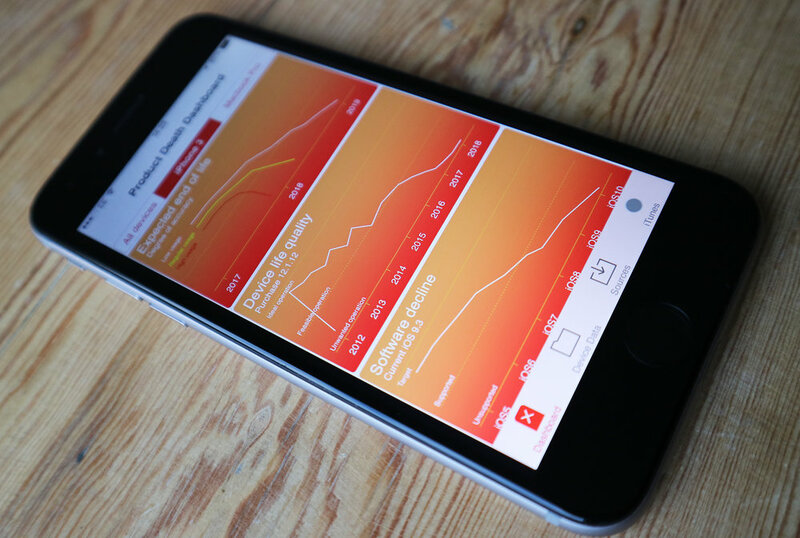 Each screen represents a step achieved in assembling parts of the iPhone consumer experience. Once committed, the consumer builds on this process by adding new services and functionality like Apps from 3rd parties, thus diversifying the product’s benefits and value. The consumer can now enjoy full usage of the device’s potential. The current off-boarding of Apple’s products, as I have demonstrated earlier in this article, is far from complete. Components like battery life, software stability, screen state or even handing back old devices are experiences without a narrative. Off-boarding is untethered from the rest of the Apple experience, with messages that leave the consumer confused and forced to make assumptions about what to do. At the end of the consumer lifecycle we should aim to pull these random threads of experience together again. Problems like the alerts to bad cables, poor battery, and app failure, are currently barren and without a positive action for the consumer to take. What would be better would be for them to be assembled into an opportunity for reflection. Apple has numerous sources of information and knowledge about a product’s health and consumer behaviour and these should provide ample opportunity to make predictions about off-boarding. An off-boarding experience should feel similar to on-boarding in tone and style, consciously connecting it in the user’s mind to the rest of the Apple experience. It should pull together things like battery failure, age of device, broken screen and software limitations in a single narrative voice. This narrative voice could then provide a destination and common language to trust as the device declines over time. The consumer should then feel that they have support in this transition. Were it to exist, this theoretical off-boarding assistant would be active over a long time period. It could capture a timely, steady, series of issues as they come up sporadically over months, even years. In regard to the family laptop we returned, which of course had not been turned on for weeks, this event could have been understood and pre-empted (age of device+state of battery+usage patterns = off-board now) by Apple. This could then have been communicated to me and my family (the consumers), via other devices linked via iTunes, with a message that indicated issues, risks and positive actions to take. A process like this would put Apple on the front foot of reclaiming old devices,actively nurturing consumers to off-board old machines in the right way. Many of the messages that the consumer currently receives about declining quality are informative, but un-actionable, so providing a generally negative experience for a consumer who desires empowerment. An improvement would see consumers instructed to do something about it. This could maybe be advice about maintenance or the average lifespan of products, or even a diagram of information showing the expected lifespan of the product. This suggestion might be considered rather extreme, and many readers might object to the idea. But I ask them to look at Kia cars. In essence, the Kia car manufacturers agreed a funeral day with their customers for their cars 7 years in the future. Imagine how useful that is for sales, knowing when your customer might be ready for another product and being included in that decision. Kia cars, by the way, have doubled their market share since introducing the 7 year warranty. When the consumer purchases a new device, she or he is often replacing an old device. Acknowledging this as part of the on-boarding experience could be useful in raising awareness of recycling opportunities, or ways to sell or pass on an old device. This could also be linked directly to Apple’s social responsibility programs, either in the packaging as the consumer unwraps their new purchases, or in areas of the phone interface at Set-Up. These could really fertile areas to gain a response from the consumer. Although Apple leads the way in consumer experiences, they are still locked into a consumer model from the previous century’s consumer boom. 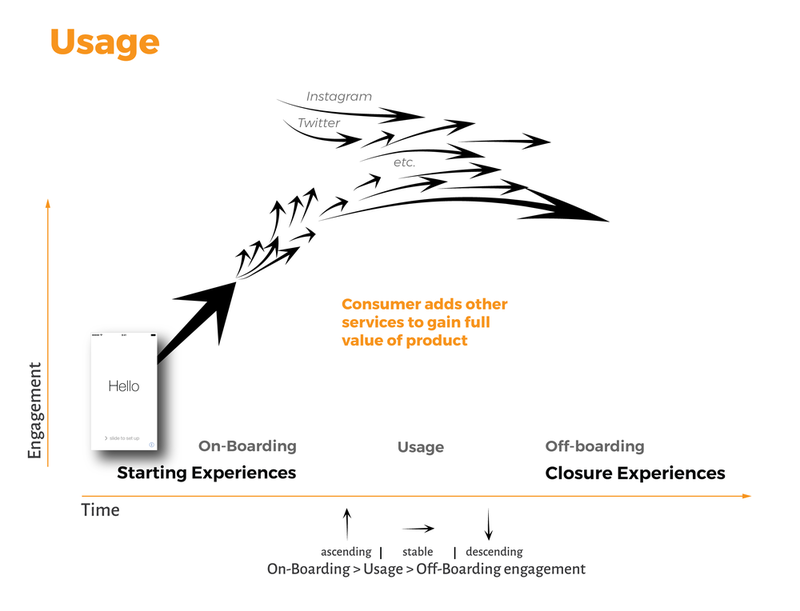 That model celebrates a biassed consumer lifecycle of on-boarding and usage and denies a reflective, emotional and responsible off-boarding experience for the consumer. Apple has the assets, the platform, the funding and the need to rethink their bias approach, I only hope they take the initiative. Newer PostFlow through end states in GDPR.